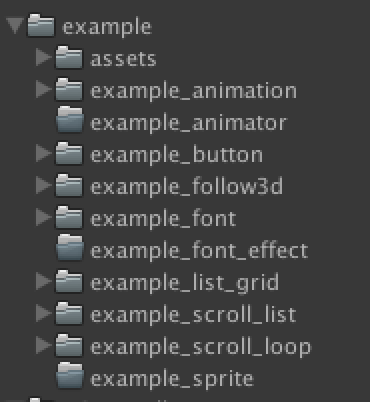 In Unity3D 5.3.2+ , the uGUI has not enough compontent to build GUI system. So this repository can improve it . # Unity3DuGUI-Toolkit In Unity3D 5.3.2+ , the uGUI has not enough compontent to build GUI system. So this repository can improve it . Count number from small to big. Make the ui follow 3d whatever it move to any place. Help you play sound when you click button. Use texture to display number. Look like LayoutGrid, and the same function. maybe i will remove it later. Help you to create a loop scroll view. you can see it in the scroll loop example to understand what is it and how to use. Help you to create a Scroll list which can add large mount units in it and performance really good. You can see the scroll list senior example to know what is it and how to use. The event of the gui. we use UI_Event to add input listener. So it is the core of gui. Help you to create Tween color animation in ui. help you to create tween alpha animation in ui. help you to create tween position animation in ui. help you to create tween rotation position animation in ui. help you to create  tween scale position animation in ui.